Jeremy Brooks, Agricultural Educator, Darla Steele, Agricultural Educator, Michael Steele, SC Young Farmer Agribusinessman of Year, & Jason Creamer, ArborOne Farm Credit. 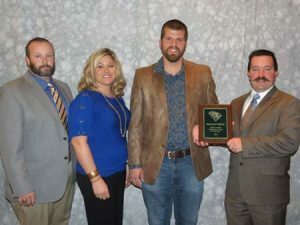 Michael Steele of Ridge Spring, SC, has been named the SC Agribusinessman of the Year Award by the SC Young Farmer and Agribusiness Association. He received an engraved plaque and a cash award from ArborOne Farm Credit who sponsors the recognition program in conjunction with the agricultural association. Jason Creamer of ArborOne Farm Credit presented the award to Michael. Michael serves as vegetable and irrigation manager at Titan Farms. Titan Farms is a fruit and vegetable operation located in Ridge Spring, South Carolina that supplies peaches, bell peppers and broccoli to several large chain stores throughout the United States. They also have two fruit stands and provide for several farmers’ markets with various other fresh products. Titan Farms produces approximately 5500 acres of peaches making it the largest peach operation in the southeast and third largest in the nation. They also produce 375 acres of bell peppers, 275 acres of broccoli and 60+ acres of additional fruits and vegetables for the local fruit stands. Michael got started in agribusiness during high school (2001) as a summer worker for Titan Farms. After high school he attended Clemson University to further his agriculture knowledge through Agricultural Mechanization & Business. Throughout college he interned with Titan Farms working in several different aspects of the business but found his real love to be in the vegetable operation. After graduation he interviewed with Titan about serving as their vegetable manager and started January 2008. Titan is a family owned business; owned and operated by Chalmers and Lori Anne Carr. Once a fulltime employee with Titan, he began managing and operating their vegetable production which was 200 acres of bell peppers, 100 acres. of broccoli and a few acres of mixed vegetables. At that time he was using helpers from the field from time to time as needed. Now, six years later, he is producing over 375 acres of bell peppers, 275 acres of broccoli, 30 acres of watermelons, 10 acres of cantaloupe, 10 acres of egg plant and a 10 acre mixed garden for the roadside markets with several full-time vegetable employees. Michael is an active member and vice president of the Edgefield County Young Farmer and Agribusiness Chapter. He is married to Agricultural Educator, Darla Steele and they have one daughter, Beckett. Jeremy Brooks and Darla Steele, Agricultural Education instructors at Strom Thurmond Career and Technology Center, serve as the professional advisors to the Edgefield County Young Farmer and Agribusiness Chapter.